Buffington Island lies in the Ohio River a half mile downstream of the town of Portland, Ohio, and three miles upstream from Ravenswood, West Virginia. On November 25, 1797, Joel Buffington of Kanawha County, Virginia, purchased the 150-acre island from John Pearce Duvall of Mason County, Kentucky, for a total of five shillings. At that time, virgin timber covered most of the island. Originally called Amberson's Island or the Island of Duvol, by 1807 people most commonly referred to the island by its present name because of the Buffington family’s ownership. Before the end of the American Civil War, the island served as an Underground Railroad stop and as the lair for John Lockwood, Ohio’s last river pirate. Over the decades, Buffington Island has been used for agricultural and mining purposes. In 1993, the whole island received protection as part of the Ohio River Islands National Wildlife Refuge. Buffington Island is best known for its association with the largest battle to occur in Ohio during the American Civil War. Morgan's remaining men (about 1,100 of the 1,800 engaged) managed to escape from the battlefield and continued in a northerly direction along the Ohio River, hoping to find a place to cross. Twelve miles upstream from Buffington Island, Morgan's Raiders found an unprotected crossing at Reedsville in Meigs County. Over three hundred of the Confederates succeeded in crossing the river before Fitch’s Union gunboats arrived. Morgan and his remaining 800 soldiers retreated westward and southward through Meigs and Gallia counties and then moved in a more northeasterly direction through Vinton, Hocking, Athens, Perry, Morgan, Muskingum, Noble, Guernsey, Harrison, Jefferson, Carroll, and Columbiana counties. Southwest of Salineville, in Columbiana County, Union cavalry under the command of Major W.B. Way engaged in a running battle with Morgan’s remaining 475 troopers. After an hour and half of fighting, the action around Salineville resulted in over one hundred Confederates killed, wounded, and captured, and less than twenty Union soldiers wounded. Three miles west of West Point in Columbiana County, Major G.W. Rue’s Union cavalry surrounded Morgan's Raiders and succeeded in capturing Morgan and 364 of his command. The surrender occurred at about 2 PM on July 26, 1863. Morgan's capture marked the end of his raid of the North. The Battle of Buffington Island did not actually take place on the island in the Ohio River. The battle occurred on the adjacent bottomland on the Ohio side of the river. Buffington Island is near the small community of Portland on the Ohio River in Meigs County. 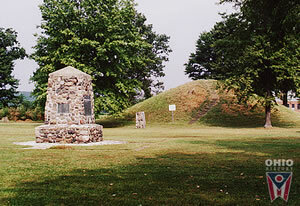 The Ohio History Connection maintains approximately four acres of the battlefield as a historic site, but nearly 1,230 core acres of the battlefield lie in private hands, of which about 600 acres have been lost to mining and housing development. Preservationists are working to save key portions of the remaining battlefield as a memorial. Cahill, Lora, and David L. Mowery. Morgan's Raid Across Ohio: The Civil War Guidebook of the John Hunt Morgan Heritage Trail. Columbus, OH: Ohio Historical Society, 2014. Swick, Ray. "Buffington Island," e-WV: The West Virginia Encyclopedia, January 20, 2012.